Religion is faith and Hinduism is by far the most tolerant religion – perhaps this explains the reason why many try to hurt the religious sentiments of Hindus and remain unscathed.. there have been very many instances of people talking or violating the established practices of other religion and have had to pay for the same….. ........... A Hindu is tolerant, kind, remains calm and unperturbed even when there are infringements !! To us Tirumala Tirupathi is one of the most reverred places. We say “Kovil, Thirumalai, Perumal Kovil” – representing “Srirangam, Thirupathi and Kanchipuram”. The most auspicious and sanctified temple of Sri Venkateswara is located on the 7th peak – Venkatachala of Tirupathi Hill and here Lord Srinivasa has His temple, providing everything to all his devotees. Crores visit this temple everyday and donate to Lord in every form. The Lord’s Presidency – the temple of Sri Venkateswara has acquired unique sanctity in Indian religious lore. The Sastras, Puranas, Sthala Mahatyams and Alwar hymns unequivocally declare that, in the Kali Yuga, one can attain mukti, by worshipping Venkata Nayaka or Sri Venkateswara. The benefits acquired by a piligrimage to Venkatachala are mentioned in the Rig Veda and Asthadasa Puranas. In these epics, Sri Venkateswara is described as the great bestower of boons. There are several legends associated with the manifestation of the Lord at Tirumala. It is sad that amidst lakhs of such devotees, who come to have darshan of Lord, some politicians also come. Tirumala everyday has people of all sorts, of all echelons, the mighty, powerful, most rich, authorities, educated, bureaucrats, industrialists, agriculturists, professionals, and from every walk of the society lining up and that includes politicians, many of whom are religious and want to worship Lord. - in between exist some politicians hell-bent on hurting the sentiments of Hindus, by speaking ill and by violating established practices. History is replete with instances of sufferings of such people. Yet they fail to learn from the mistake of others and try their hand in such invidious acts - YS Jaganmohan Reddy did that recently and unabashedly trampled the sentiments of believers. 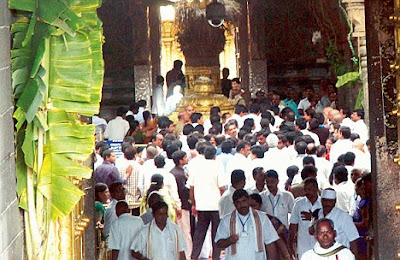 The entry of YSR Congress chief Y S Jaganmohan Reddy, a Christian by religion, into Tirumala Balaji’s temple on Wednesday without signing the mandatory Declaration form for non-Hindus has stirred up a fresh controversy in the temple town of Tirupathi. Some Politicians have sight only on the elections and on making money - Tirupathi is slated for by elections in June. The Kadapa MP along with Bhumana Karunakar Reddy, former Tirumala Tirupathi Devathanams (TTD) chairman and YSRCP candidate for Tirupathi, Assembly seat and a large group of supporters had a darshan of Lord Venkateswara. The TTD authorities had organised a special darshan as per the protocol for a Member of Parliament and former TTD chairman. The TTD authorities responsible for taking the signature were jittered and did not act properly. There can be no two ways about that. Either you sign and enter or no entry if no signature. All non-Hindus have to sign the form, declaring their faith in the Lord and how and why should there be any exemption, especially when somebody arrogantly claims that one would not. He simply bulldozed his way into the temple, which was unwarranted and should not have been allowed at all. Unlike Jagan, it is stated by some that the late YS Rajasekhar Reddy had a special and unusual bond with the temple town of Tirumala-Tirupathi. Although a converted Christian, YSR always had faith in Hinduism and was an ardent devotee of Lord Venkateswara. But it was during his tenure that government was entangled in many controversies involving the affairs of the TTD, which included practising of evangelism in Tirumala, reducing the jurisdiction of the holy hills, providing VIP treatment and the gold coins scandal et al. Jagan Reddy's supporters claim, that he had visited the temple earlier, in 2009, and had signed a declaration at that time. According to the supporters, the procedure need not be repeated. How ridiculous this is – if he embraces Hinduism or is a believer of Hindu Gods, perhaps no declaration is required. Would he give away any other benefit just because he had had them earlier ? It had some political fall-out. “Jagan can’t bulldoze his way into the temple as he has been doing all these years with his father’s support,” Dadi Veerbhadra Rao of the TDP said. There was some response from some other quarter stating that the same TTD had failed to secure Sonia Gandhi’s signature on the declaration form are now making the hue and cry to please the ruling party. TTD Executive Officer, LV Subramanyam has said an inquiry has been ordered into the incident. Interestingly, the well-defined rules are not the creation of Hindus alone, though they have every right to administer their temples in the manner that would maintain the age-old rituals and practices of the Temple. Bruce's Code is a set of rules for the management and administration of temples of Tirumala and Tirupati including the servants, enacted by East India Company in 1821 A.D. These were the well-defined rules formulated as a code having 42 provisions to ease the administration of temples of Tirumala and Tirupati on the basis of customs and previous usages without interfering in the day-to-day affairs. History has it that even during the reign of the Nawabs of Arcot, the net income of the temple was appreciated by the secular authorities for their own functioning by depriving the temple lands from the non-hindu rulers either through self aggrandizement or through alienation of certain hereditary servants of the temple in order to ensure permanency of service in the temple. In 1803, the then Collector of Chittor, within which Tirupati district is situated had sent a report to the board of revenues showing the full account of the institution, together with schedules, pujas, expenses, and extent of lands etc., known as "Statton's Report" on the Tirupati Pagoda. These reports are in the same lines as the earliest report submitted to the british government on Jagannath Temple by "Grome" and "Garrett". British rulers used "Statton's Report" to control and manage the institution till a set of rules for the management of the temple and the servants, were framed in 1821 A.D known as "Bruce's Code". There are clear records that since at least 1933, non-Hindu visitors have to sign a form, stating, “I have full devotion, faith and belief in Lord Venkateswara,” with name, address and signature. The practice has become more systematised since the 1960s, TTD sources said. Some reports state that many prominent non-Hindu devotees who visited the Tirumala temple include former railway minister Jaffer Shariff, former Jammu and Kashmir chief minister Farooq Abdullah and former president A.P.J. Abdul Kalam who have all duly signed the form of faith declaration. In Jagan Mohan Reddy’s case, things were different as he reportedly entered with a group of slogan shouting cadres.A mobocracy ! – another way of flouting rules and how did TTD allow bigger group even as part of VIP entourage !- perhaps another bad precedent…. In all probability, Jagan was trying to woo the hindu voters by visiting Tirumala but by his act he has only hurt their sentiments and would pay dearly for it. The BJP's state spokesman NVVS Prabhakar said Jagan should have followed the temple rules. 'Every place of worship has its rules. A Hindu entering a mosque during prayers will have to wear a cap. One can't enter the Golden Temple in Amritsar without covering his head. Similarly, Tirumala temple has its rules. Jagan's act is nothing but blasphemous,' he said. Power corrupts and many a times politicians do not learn that, their fame and glory are short-lived. Jagan also would learn it one day !! Jagan would sure become political nobody and his morons would understand and feel their folly.